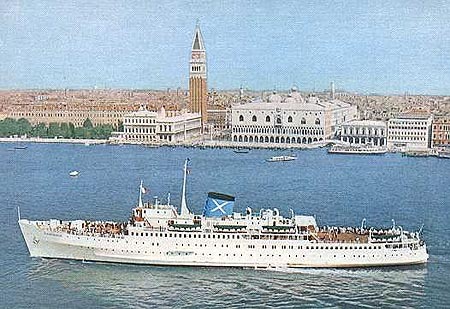 The Fantasia was previously the British Railways steamer Duke of York. 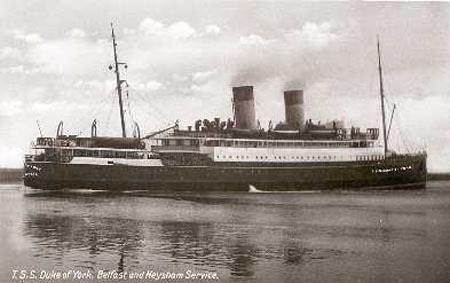 She was built by Harland and Wolff in 1935, as a two-funnelled steamer for the LMS Railway's Heysham-Belfast service. 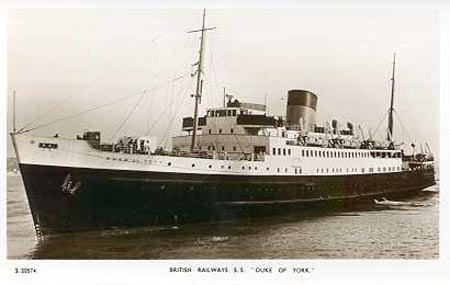 After service in WW2, Duke of York was rebuilt with a single funnel. She was transferred to the Harwich-Hook of Holland route, after passing from the LMS to British Railways. 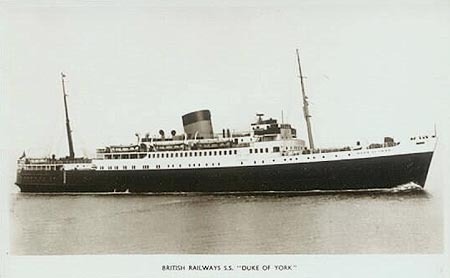 In May 1953, Duke of York had a serious collision, in fog, with the American freighter Haiti Victory. The bow section was sheered off completely. She reappeared with a new, more modern bow. 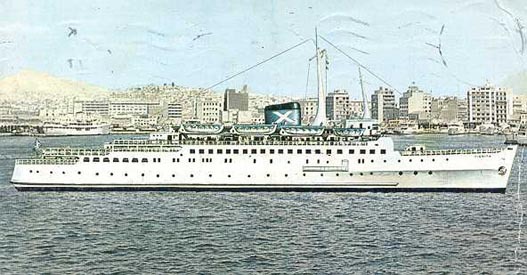 She was sold to Chandris Lines, and entered service in 1964 as the Fantasia. 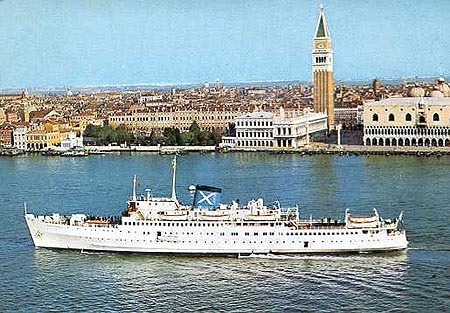 She ran mainly on cruises in the Eastern Mediterranean, with some winter charters to religious tour groups. She was withdrawn in the mid-seventies and scrapped in Spain. 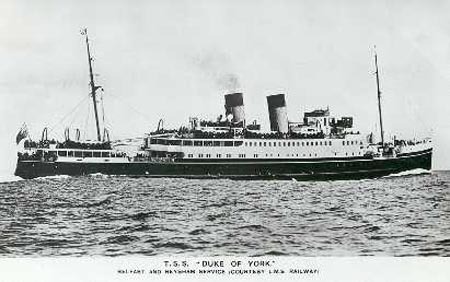 The Duke of York was built by Harland and Wolff in 1935, as a two-funnelled steamer for the LMS Railway's Heysham-Belfast service. This real photographic card, published by W.E.Walton of Belfast, shows the Duke of York as built with two funnels. Photographic postcard of Duke of York with two funnels. This crudely faked photo is of one of the earlier Heysham-Belfast Dukes, not the Duke of York as claimed. 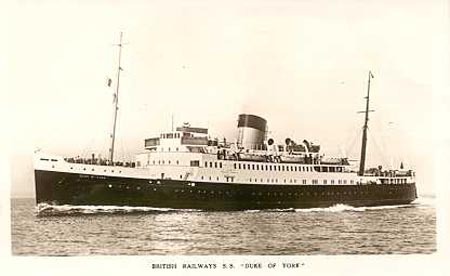 After service in WW2, Duke of York was rebuilt with a single funnel. 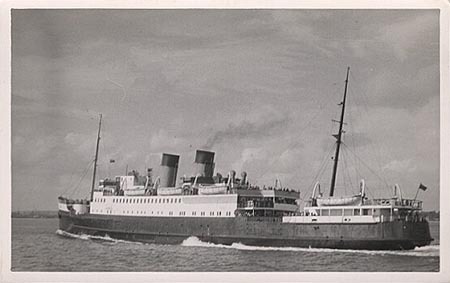 She was transferred to the Harwich-Hook of Holland route. This is an official British Railways card of the period. 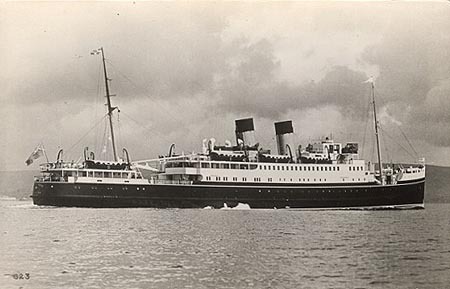 In May 1953, Duke of York had a serious collision, in fog, with the American freighter Haiti Victory. The bow section was sheered off completely. She reappeared with a new, more modern bow, as shown in this Bridge House card. British Railways official postcard of Duke of York. A very similar card, but using a slightly different photograph. Note the different covers on the lifeboats. but is in fact a rather poor painting of Fantasia.